The debut of a "striking" new voice in fiction ( Entertainment Weekly) Before You Suffocate Your Own Fool Selfoffers a bold new perspective on the experience of being young and African-American or mixed-race in modern-day America. In each of her stories, Danielle Evans explores the non-white American experience with honesty, wisdom, and humor. They are striking in their emotional immediacy, based in a world where inequality is a reality, but the insecurities of young adulthood and tensions within family are often the more complicating factors. 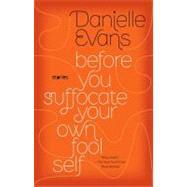 One of the most lauded debuts of the year, Before You Suffocate Your Own Fool Selfannounces a major new talent in Danielle Evans. Danielle Evans is a graduate of Columbia University and the Iowa Writers' Workshop. Her stories have appeared in The Paris Review, A Public Space, and The Best American Short Stories 2008.